Congratulations! You finally received your TEFL/TESOL certificate to teach English as a second language. What is your next move? When I received my certificate, I was excited and ready to seize the many opportunities that I didn’t expect to come flying my way. I am a native English speaker, born and raised in the United States, but I had zero experience with teaching. Never taught a day before in my life! I thought getting into teaching online would be a nice and smooth transition to the ESL world. You can teach small children online from classrooms in China, or tutor adults one on one around the world, who are just looking to practice speaking English in a normal conversation. There is a high demand for English teachers online around the world, and the jobs available are endless. I get about 200 emails a day from schools looking to hire teachers. Even better, I was offered my first teaching job online within the first couple of days of applying! Now I have 3 jobs online, and about to travel the world and work remotely from my laptop. First things first, get your resume ready to start applying online! Of course, resumes are always the most important document to have prepared. Your resume must look nice and professional. It must include, your educational background and past work experience. When applying for jobs around the world, they do require the same information, but your resume should be shorter and have basic facts about yourself. Not too much detail, since you are applying for jobs around the world where English is their second language. It is best to not have your resume more than 3 pages long. Include your name, address, Skype name, (for interviews), and contact number with your country code. Around the world, some countries like in Spain, want to know your citizenship, marital status and your DOB on the resume. List your objective, which should be simply stated something like, “TEFL Certified, seeking an online teacher or tutor position. Experience working with children and adults.” Resumes should list your educational background first, that is the most important information that schools want to see first. Most important to mention, if you have a degree and/or are TEFL certified. List your educational background, and then your past work experience. Name the school, dates you were employed, and no more than 4 facts about your experience for each job you list. Good facts to mention, ages of students you taught, nationalities you taught, type of teaching environment you worked in, teaching methods, how many days a week you taught. Of course, also mention at the end of your resume, any other skills or experience you have that would be beneficial to mention to the school you are applying for. To the right of my name, address, Skype name, and contact number is a nice photo of myself on my resume. I am looking right into the camera and smiling. The photo shows my face from my neck up, but I am still wearing a nice long sleeve shirt with a scarf, showing no skin. Sorry, it is not recommended to use a selfie! You might be able to get away with it, but I would just have a friend take a nice picture of you. Dress nice, and smile friendly towards the camera. You want to look nice and professional in the photo. When applying for jobs online, a lot of schools ask for a cover letter to include in your resume. I would do a cover letter that is not longer than one page. Then it is good to mention a quick summary of your teaching experience and methods, ages of students you work with, and if you have experience online or in the classroom. I also like to mention how I could be beneficial to each particular school I am applying for. Like, if I was applying for an online teaching position to work with kids, I would mention my teaching techniques for children, and props I can use, like stuffed puppets. Not all jobs you apply for online will require such videos, but a lot of them do ask for it. That is why I just made one introduction video to share with all, about a minute long, (no more than 2 minutes). I just mentioned important things like I am a native English speaker from the USA, I am TEFL certified, then I mentioned my educational background, and past work experience, I included teaching techniques and methods I use. Don’t make a video from your iPhone, if you have a MacBook, I just make videos from my Photo Booth App. You can also make a GoPro video, or have a friend make a video for you. Some schools will even ask for a mock lesson that you make of your own, like in a mini 5-minute video. If you are wanting a job teaching kids, maybe make a fun video about teaching kids the face, include dolls, toys, or puppets. I made a mock video for adults, pretending to teach them family members. I used realia, photos of my own family, and did a 5-minute lesson teaching adults about family members. Now start doing your research and apply for jobs! 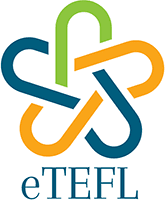 eTefl Online can help you with all the above-mentioned steps in their services and sends an abundance of information and job sites to student’s emails on the daily. You can post your resume to these sites and recruiters will immediately start contacting you. Different job listings to check out, are like Dave’s ESL Cafe, Teacherlingo, Teaching Nomad, and many more! China is probably the most popular country that is constantly hiring for online English teachers all year long. Their peak hours, in Beijing time, is between 6pm-9pm. Most of the Chinese schools I see that are hiring online are looking for teachers to work with children. The wages can range from $9 to $30 an hour, depending on education and experience. So many great and many opportunities are available in China, definitely one of the best countries to start applying for right away. There are also many great opportunities for online English tutors as well. Working mostly as a tutor online, will give you more control of your schedule and pay. Two great companies to apply for would be Cambly or SkimaTalk. Both easy jobs to apply for, and you usually get a job offer within the next couple of days after applying. I started working immediately as a tutor when I received the job with Cambly and SkimaTalk. Tutoring online is a great way for new teachers to ease into teaching for the first time and unlike other “Teach English Online” program, its really effective. My first teaching job online was being a tutor for adults. I was extremely nervous and felt very inexperienced, and felt like I was making mistake after mistake. What ended up giving myself more confidence and relief, was to remember that the student you are speaking to is nervous as well! The student probably isn’t understanding most of what you are saying and is just wanting to speak English. Remember, there is a huge language barrier, between teacher and student. As well as cultural differences and understandings. I always reminded myself of this, shook off the nerves, and learned from my funny moments I had with the student, when I realized what I was saying or doing wasn’t working. Everything is a learning process, especially if you have no experience. Don’t stress, and do your best! That is why getting your TEFL certificate is extremely important because getting certified prepares you for all the basic knowledge and tools to teach effectively.